Early Bird offer ends in 2 weeks! if your life is anything like mine you probably can’t believe it’s officially December next Monday! Well with so much going on you probably haven’t realised there are only two weeks left to get the Level 2 1st4sport Certificate in Strength & Conditioning Early Bird Price. 1. It’s unbelievable value- £370 for a Level 2 Qualification is one of the best value qualifications on the market! 2. Unlike some qualifications, you don’t need to do a Level 1 first! 3. 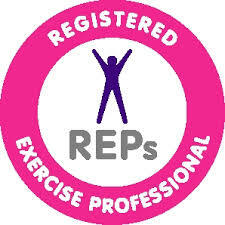 You are qualified in 4 days of intensive training, plus 4 weeks of coaching in your work place. And what is more, if you’re having trouble getting 4 weeks of coaching done, I’ll even offer to let you do it under my supervision at my own work place! Bottom line is that if you’re looking to get into the industry, then this qualification will enable you to gain the skills you will need to be able to deliver S&C programmes, and hopefully get that job you’ve dreamed of. The Level 2 qualification is ideal for coaches looking to gain the skills and experience to assist the Lead coach in professional organisations. So what are you waiting for? Book now and kick start your Strength & Conditioning Career. http://athleticperformanceacademy.co.uk/wp-content/uploads/2015/05/APA-Logo1-300x156.jpg 0 0 darren.drake http://athleticperformanceacademy.co.uk/wp-content/uploads/2015/05/APA-Logo1-300x156.jpg darren.drake2014-11-27 09:29:552014-11-27 09:29:55Early Bird offer ends in 2 weeks! Why modern education is killing our kids! This Blog post is a departure away from my usual writing. As some of you may know I’m as passionate about coach education as I am about coaching itself. As part of my journey to becoming a coach educator I am now enrolled on a teaching qualification. For those of you who are in the fortunate role to provide Coach Education I just thought I would share with you a few key learnings from my first two days on the Level 3 Award in Education & Training (AET). I love being able to reflect on my own education journey and think how I will change the way I do things to influence the next generation. It’s that old cliche that if you pick up one key pearl of wisdom it will be worth going. Well my biggest pearl was to be introduced to Sir Ken Robinson. Our tutor showed us this Youtube video just before lunch to give us something to discuss over lunch. I was gripped. Sir Ken is an educationalist who encouraged me to think about creativity and divergent thinking, an essential capacity for creativity. Creativity is the process of having original ideas that have value. Divergent thinking is the ability to see lots of possible answers to a question and the ability to think laterally. There are so many achievements that characterise the ascent of human culture. But in his opinion we destroy this natural creativity in the way we educate people. Not everyone will benefit from a standardised way of learning, being force fed information that they may or may not be interested in. We’re still getting our children through education by anaesthetising them rather than waking them up!! Instead most great learning happens in GROUPS. Collaboration is the stuff of Growth. But yet we have achievement standards that learners need to reach by working in isolation on a test paper where there is only one answer! 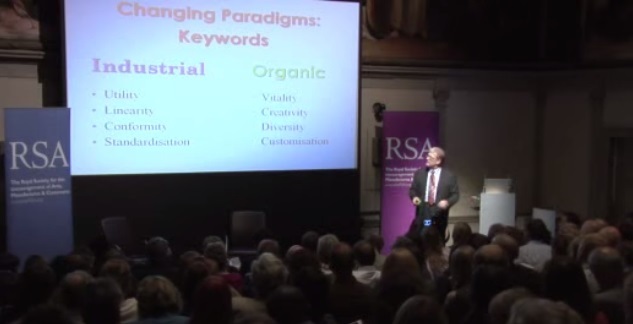 We need a shift from an industrial metaphor of education to an agricultural one. Human organisations are not like mechanisms (even though organisational charts still represent most organisations like this) they are like organisms. The way you work in an organisation is deeply affected by how you feel about it. So I challenged myself to think out of the box and give a 15 minute presentation on Strength & Conditioning without the use of powerpoint. Before I did my presentation I had a really good session on Delivery Methods. 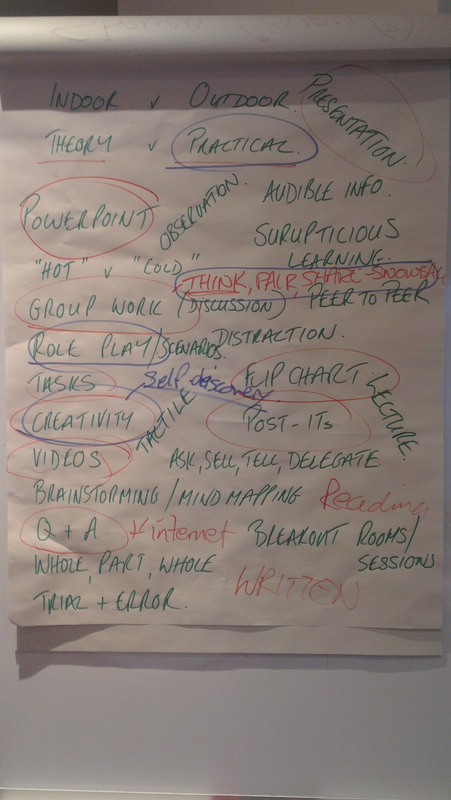 We did a group brainstorm on different delivery methods we could use to share information and here is a photo of the brainstorm on the flip chart. So fuelled with lots of ideas I went and did my presentation. The presentation was really well received and it gave me a lot of satisfaction in achieving the learning objectives without being constrained to the use of powerpoint. 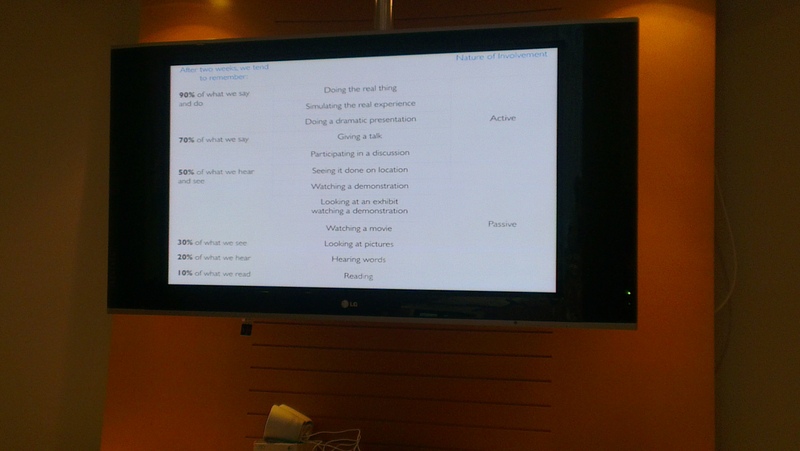 Rather than just tell people by showing them words on a page and reading them off, I cultivated group discussions, I showed them videos and I got them to do some practical tasks. This is what our tutor meant by Tell > Show > Do, where learning sticks more, the more INVOLVED you are in it! Out of interest compare how much information you took in when you listened to Sir Ken speak on the full 55 minute lecture and just focused on the words, with the 10 minute illustrated version where you were constantly looking at pictures too! They say a picture paints a thousand words! Go out there and be creative!!!!!!! http://athleticperformanceacademy.co.uk/wp-content/uploads/2015/05/APA-Logo1-300x156.jpg 0 0 darren.drake http://athleticperformanceacademy.co.uk/wp-content/uploads/2015/05/APA-Logo1-300x156.jpg darren.drake2014-11-22 14:55:042014-11-22 14:55:04Why modern education is killing our kids! These two points are actually secondary for me when I’m interviewing a prospective coach because I believe that the passion to inspire an athlete by creating a great training environment is what I look for first. The technical knowledge to know what to observe and give feedback on is something I feel I can teach more easily. But if you can do both then even better! A big part of your role as a coach is to observe performance. You observe the athlete’s performance and evaluate it. First and foremost you have to set up a great training environment to ensure that the athlete is giving you an account of their best effort. If you have failed in achieving the first task then there is no point observing something where the athlete is not trying. So observation has to be an integrated approach starting with mental effort (i.e., their mindset to give 100%). Drill– are they doing the drill the correct way? So are they using the correct equipment, are they following the instructions? 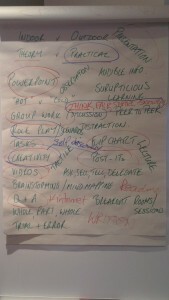 Will– overall does it look like there is Mental & physical hard and smart (engaged) work taking place? Skill– are they using the correct techniques to get the outcome? This process applies for all athletes. But we do need to consider the different needs of different levels of athletes. Now clearly in this type of setting you need to know your stuff. The athlete is highly motivated and the Drill and Will is being observed properly. You need to have a good level of technical knowledge and you need to know what the fault is that is creating the failed lift when you are observing performance. The slight heel lift of the left foot is the ‘mouse in the room.’ It’s a small fault but it makes a big difference to an elite athlete’s performance. This heel lift is the skill that needs to be addressed. Again observation skills are really crucial here as there are some much more obvious dysfunctional motor patterns that can be observed here that require feedback. With novice athletes there may be several things you have observed that you want to give feedback on. In a previous blog I talked about how novices provide inherent variability in their performance (which creates a great learning environment). So the tendency might be to try and correct all the movements by raising their awareness to all of them. But another approach suggests we should keep them focused on the task outcome and limit how much feedback we give them. So how much feedback should we give? Forgive me for going off on a tangent but I have recently been inspired by the views of a pragmatic educationalist called Sir Ken Robinson. For me I see a lot of parallels with coaching and teaching, and it’s in the way we teach (and give feedback) that we can really make an impact on the athlete we are working with. He talked about the flipped classroom approach: where you don’t teach them everything. You get them actively involved in teaching themselves and teaching each other. Ives & Shelley talk about the need to develop a ‘non-awareness’ strategy, which relates to the same idea of letting the child take control of their own learning through discovery learning. So what is Discovery Learning? ”To illustrate for functional training, we suggest that athletes not be told to perform weight training exercises with specific techniques. The athlete,within the bounds of safety, should be free to explore the exercises and become aware of their own movement effects and perceptual outcomes. Don’t rigorously defining‘proper’ form. With no instruction, the athlete may search endlessly for a proper movement solution. Athletes may learn poor movements and adopt bad habits. Now this may be quite a lot of information to digest. This is specifically focused on skill related feedback. On a more global sense I have found the check list below very useful when considering the relevance of any feedback I want to give. Simple and clear, success-failure boundary, giving a sense of urgency as it is or it isn’t. The task and its processes offer ‘No wriggle room’. I hoped you found this blog interesting and will challenge your thinking the next time you are about to observe performance in one of your athletes!